Jaipur : The LNM Institute of Information Technology festooned on the morning of September 21 to host the 5th International Conference on Advances in Computing, Communications and Informatics, ICACCI-2016 and the 1st International Conference on Applied Soft Computing and Communications Networks, ACN’16. The Conference is expanded over the period of four days from 21st to 24th Sept covering keynotes speeches Paper presentation, Panel Discussions, Symposiums, tutorials and workshops by eminent speakers with special distinction in their respective fields, among others. In the conference total 600 papers were presented in 48 parallel sessions. 100 posters were presented with 15 keynote talks and 5 tutorial sessions. The ICACCI expands its scope to provide an international forum with the focus to provide synergetic interactions among passionate researchers, developers and students in the field of computing, communication and informatics. The first international conference ACN’16 aims at providing a platform to bring together academia, researchers,and practitioners to communicate ideas and challenges and potential solutions on themes related to applied soft computing and network communications. 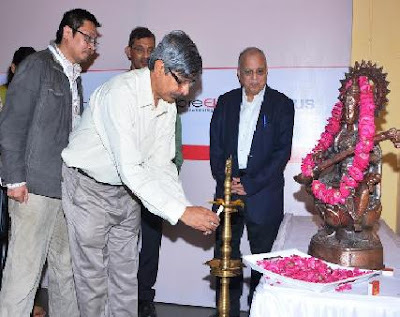 The event began in high spirits as it accompanied the propitious lamp lightning ceremony followed by the welcoming note from the Director Prof. SS Gokhle, LNM-IIT and Dean of Academic Affairs Dr. Manju Dhariwal, LNM-IIT. He also mentioned about the need to change our education system as he compared the Indian Education System with that of a “big old stone holding its moment of inertia of rest”. Further the next keynote speaker Prof. Jhon N Daigle, University of Mississippi, USA, enlightened the gathering with his work on ‘Fountain Code-based protocols for improving Internet Content Delivery’. The session has been extremely informative and edifying and it’s just a modest beginning.